Spacious three and four bedroom apartments with direct access to Main Beach and three minutes walk to town. The Terraces have a range of three and four bedroom apartments in a fantastic location just 50 metres from Main Beach, and three minutes walk to the centre of town. Each apartment is individually owned and decorated, all are fully self contained, built over several levels and have secure parking. 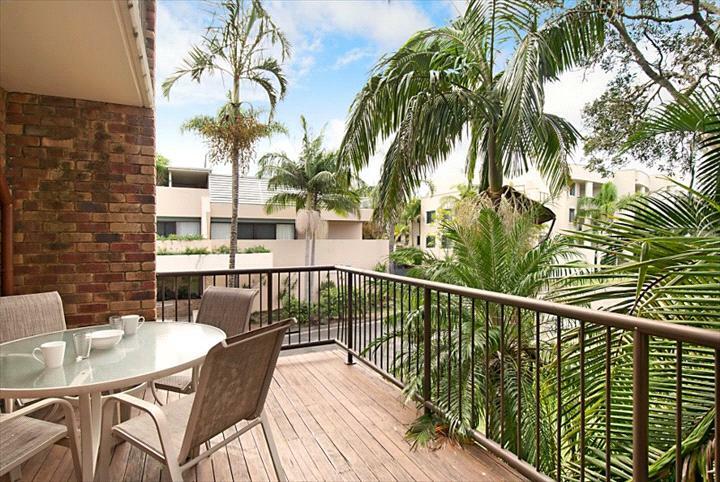 The Terraces offer great value in the heart of Byron with direct beach access. 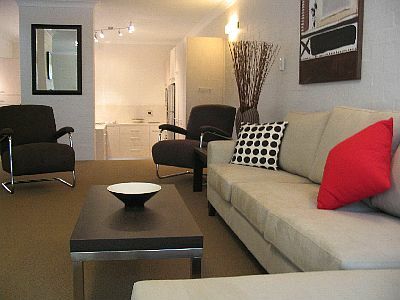 Please note: The apartments are family and couples friendly and do not accept bookings for parties, including hens or bucks nights or sporting groups. Management reserve the right to cancel those bookings which do not comply. The Terraces do not accept bookings for people under 21 years of age unless accompanied by a parent staying in the same apartment. Experience the unique atmosphere of Byron’s town centre. Close to everything Byron has to offer including a variety of restaurants, cafes and boutiques right on your doorstep. The pristine beaches of Byron Bay are only a short leisurely stroll from your holiday accommodation. 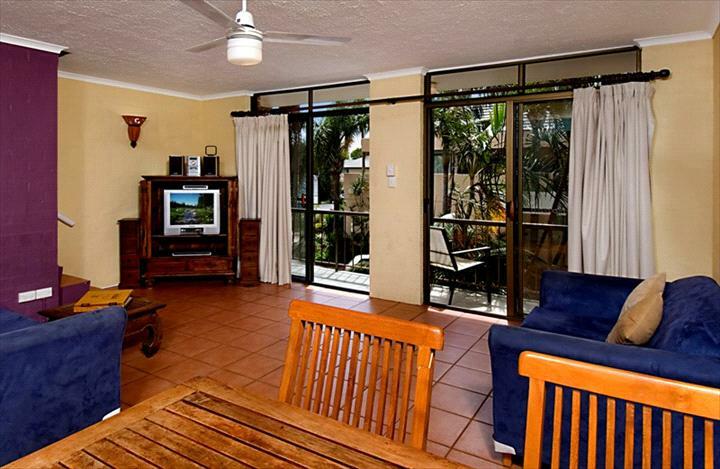 The Terraces are a 3 min walk to town centre and 1 min walk to Main Beach. T1 is a newly renovated spacious luxurious 4 bedroom 3 bathroom apartment over four levels. The 1st level offers an air conditioned living room which spills onto a spacious alfresco terrace (equipped with a BBQ) together with a luxurious kitchen & dining room. 3 bedrooms are located on the 2nd level, 2 with queen size beds and the 3rd has 3 king single beds which make this property perfect for extended families or couples holidaying together. There is also a stylish large bathroom with separate WC. 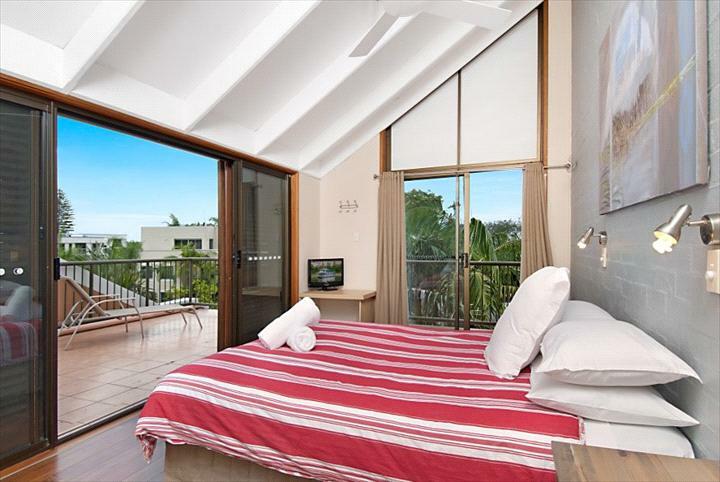 Positioned to capture the sea breezes is the loft master suite located on the top floor. The air conditioned bedroom features a king sized bed with walk in robe and a new addition of a rooftop ensuite. 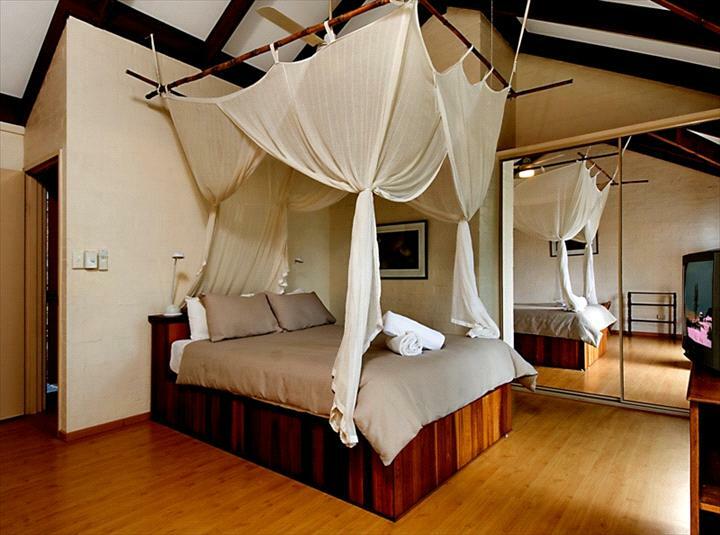 This amazing bedroom opens onto a private roof top terrace. The entry level offers a secure car park, full laundry and an additional bathroom. 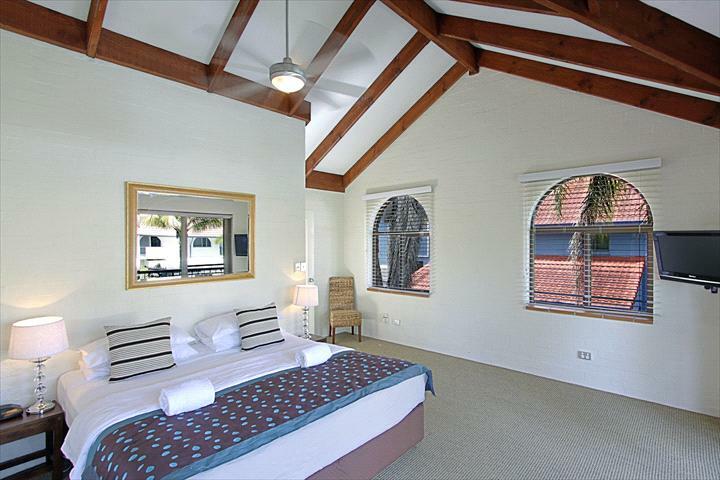 The apartment has ceiling fans throughout together with air con in the living area and master bedroom. Please note this property does not take sporting groups, hen or bucks groups and reserves the right to cancel bookings which do not comply. 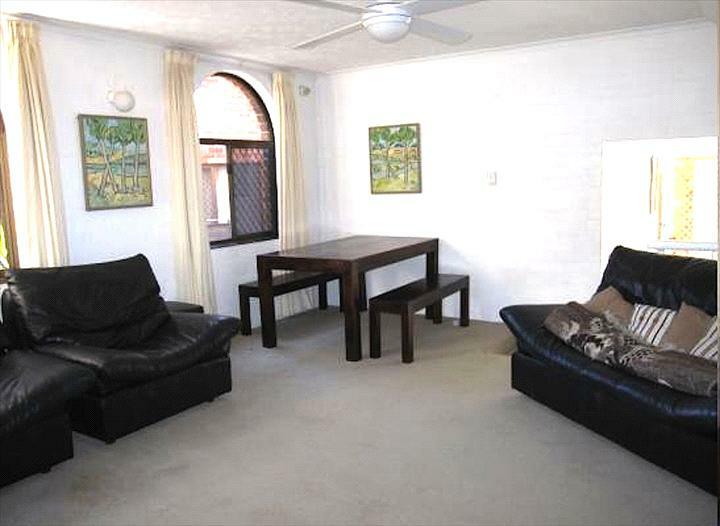 Well appointed spacious 3 bedroom, 2 bathroom self contained apartment . T2 is over 3 levels of accommodation, a separate secure carpark is located at the bottom of the apartment within the communal car park. This car park provides direct access to the apartment from within. A separate street level access is also provided to access the stairs leading to the upper levels. First floor level contains the kitchen, dining with access to a large covered deck area providing the ideal space for outdoor eating, relaxing and BBQs. The living room extends on to a sunny north facing deck with outdoor lounge. A separate rear access is also available to the kitchen from a raised first floor level courtyard. The second floor level contains 2 large double bedrooms with individual older style bathrooms. A top third level contains a loft bedroom which houses a double bed which sleeps 2. 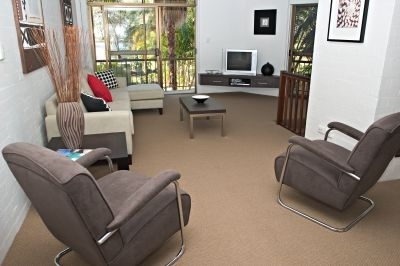 T3 is a tri level terrace apartment in a fantastic location at main beach Byron Bay. This fully self contained 3 bedroom, 2 bathroom apartment has been tastefully decorated and has security parking. The main bedroom is air conditioned, has its own balcony and occupies the whole top level of the apartment with a large older style bathroom just a few steps away. A few more steps downstairs is the air conditioned living/dining area, kitchen and twin bedroom. This level has two outdoor areas, a courtyard and a balcony. The ground level has a double room, a 2nd bathroom and laundry. 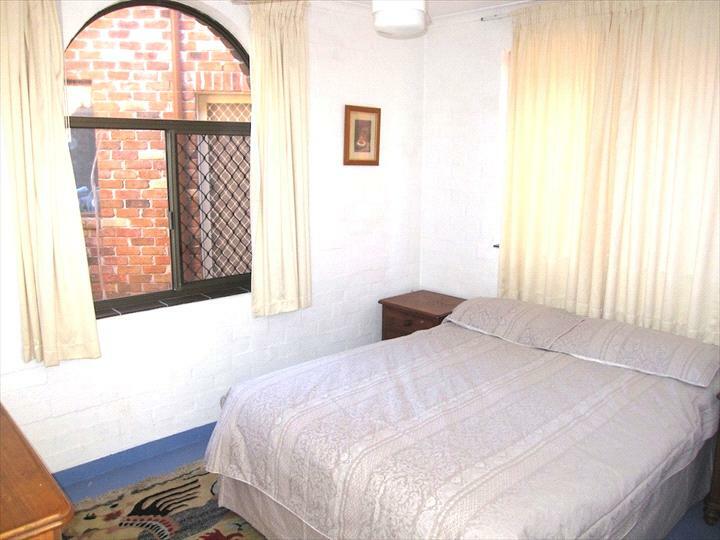 The ground level has a double room, a 2nd bathroom and laundry.. Fully renovated 3 bed 2 bath apartment set over 3 levels. The top level comprises of a parents suite consisting of air-conditioned master bedroom with TV, luxury bathroom & private alfresco retreat. Down several stairs brings you to the mid-level open plan air conditioned lounge/dining that opens onto an outdoor deck. This level also consists of a new kitchen with quality appliances & 2nd twin bedroom. The ground level offer a 3rd twin bedroom, a 2nd bathroom with laundry and entry foyer. There is an internal entry to secure car parking for 1 vehicle. .Please note, we are family and couples friendly, we do not accept bookings for group gatherings, including hens or buck nights. If you have booked for this reason you will be refused entry &/or evicted during your stay with no refund. Please note, we are family and couples friendly, we do not accept bookings for group gatherings, including hens or buck nights. If you have booked for this reason you will be refused entry &/or evicted during your stay with no refund. 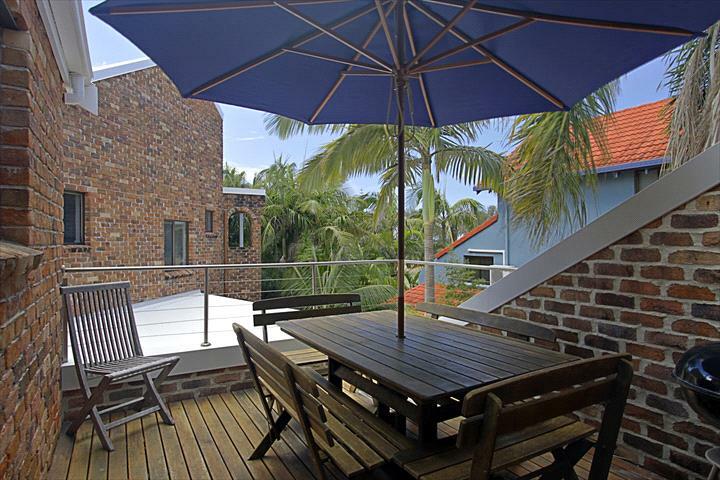 T5 is 3 levels of budget, beachside living - sleeps 6. Access to the apartment from ground / street level is by way of 2 entrances - one from the undercover car park off Middleton St and the other off Lawson St which leads to stairs and the upper levels. This older style apartment has internal access from car park to the ground floor level which contains a bathroom with laundry facilities and a double bedroom with a queen bed. First floor level contains the second bedroom (2 x king single beds), living and dining rooms and kitchen, which has a separate access entrance from the raised first floor courtyard. There is an outdoor balcony attached to living dining room with an outdoor patio. The top floor level contains the main double bedroom with King bed & a large older style bathroom..
T6 - 3 Levels of beachside living. A tranquil retreat for the larger family or groups who wish to share.